1 Why Do Cats Like To Get On Your Furniture? 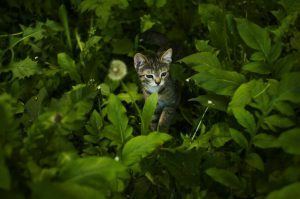 4 What To Use To Keep Your Cat Off The Ground! Hey there! If you’re like me then the thought of your cat’s naked bum-bum on your couch is probably one of the grossest things in life! Ok, maybe not that bad, but it was something to get used to and for the longest time I tried to figure out how to keep my cat off the furniture. I mean, they don’t wipe their stinker when they poop! Ok, on a serious note though, let’s talk about cats, their habits and what you can do to keep their paws happily off your furniture! Why Do Cats Like To Get On Your Furniture? What behavior is leading my cat to abc. What behavio(u)r is leading my cat to jump on my furniture? The reason I’m telling you to do this is because cats are very instinct driven. They’re not particularly trainable in the same sense as dogs are yet if you take the approach of figuring out the instinct you can manage things a lot better. What Behaviors Are Leading My Cat To Jump On My Furniture? Cats, by nature, are hunt driven. Everything from their actions, habits and build literally revolve around hunting prey. Whether its a necessity or not is irrelevant much like it is if there is or is not actual prey to hunt. Your cat still wants to. Sounds familiar? 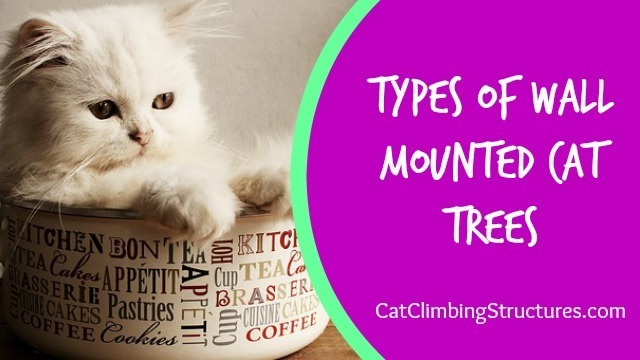 Pretty much all of these cat comforts it can find easily atop your furniture like couches, TV stands, and stair railings to name a few. 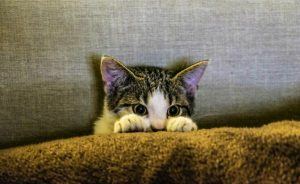 The easy fix to keep your cat off the furniture is to give them a better place to sit where they feel safer and more secure than your furniture provides them. Just opened up a box of worms? The problem is that your cat wants to be up high, off the ground, ALL THE TIME. I want you to take a minute to observe your cat. Is it there all day or just in the evenings? Does it sleep or eat there? etc. Does it hop over it to another location or does it stand up and look around? You’ll likely find that even when it’s moving from one place to the other, it will prefer to be off the ground especially if it’s hungry. Why especially when it’s hungry? Well, think about what we talked about earlier about cats being hunt driven. When they’re hungry, they’re in hunting mode so that means they’re even more inclined to stick to the perimeter of the room instead of dashing on the ground as a shortcut. 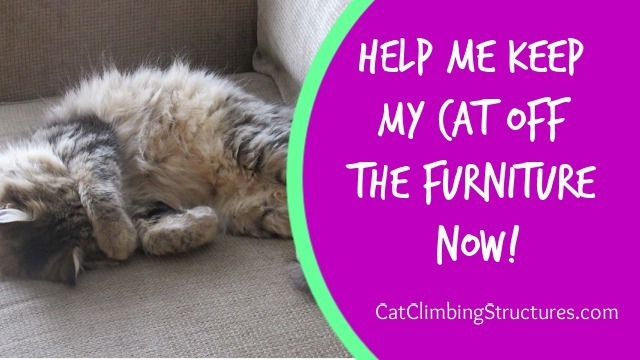 Now that you know why your cat is on your furniture we can move forward with finding actionable steps to keep them off the furniture. The master plan of action you need to take is to provide your cat with alternative highways around the perimeter of all rooms in your home. We’ll call this new pathway the ‘cat highway system’. We’re just about ready to create our action plan but before we get into what you need to do, I want to talk about things that you should NEVER do to you cat in this situation. DO NOT DECLAW YOUR CAT! 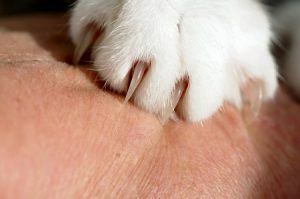 Declawing is painful and puts your cat in permanent pain for the rest of its life. This is one of the worst things that is still legal in some states to do to cats. It absolutely grinds my gears when people complain about their cats being ‘mean’ and after upon further discussion find out that their cat is declawed. NO NO NO, it’s not the cat who is mean. The cat is in permaPAIN! I don’t want to say the cat owner is mean because sometimes we assume (and rightfully so) that since you can have it done at the vet that it has to be safe. I know that this is the case for me but thankfully I found out in time before I harmed my cat and I’m hoping that I can stop you from making this big mistake also. Always do your due diligence before getting any procedure done at the vet or even for yourself. Next up, don’t yell or cuss at your cat. For one, that’s just transferring negative energy to your cat. Just as you will get negative when put in a negative environment, so will your cat. You might notice it becomes more aggressive when you do this but it is coming from the way you communicate with it. Also, do not hit your cat. Violence is not the answer and your cat will respond to this aggressively as well. Do not get rid of your cat. 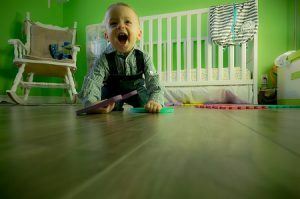 Would you abandon your kid because he’s a little out of control? Even still, would you like to be abandoned because you’re confused about what the problem is when you’re just doing what you do best? I know that sounds a little harsh but I don’t want you to feel bad. I want you to move forward in progression. Hey, I was literally in the same boat and I probably still have TONS more to learn about cats. I mean, I was going to declaw my cat at one time before I was schooled and educated properly. This isn’t a bash, its growth and I hope that you realize the same thing too. Sometimes what we really need to hear isn’t what we really want to accept. What To Use To Keep Your Cat Off The Ground! Few, FINALLY! Planning takes up so much time. I know but it is totally worth it to find a REAL solution that is safe for all parties and understanding why you are doing what you’re doing is important or things will probably just stay the same. In order to accomplish our game plan, you will need to use cat trees. 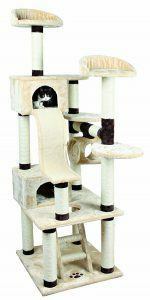 Cat trees come in many varieties, designs, and colors. 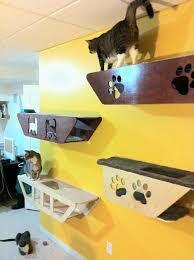 Wall mounted cat trees are literally shelves specifically designed with your cat’s needs in mind. They are not the same as a shelf that you buy from a hardware store or somewhere like that. 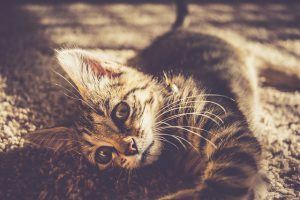 They have comfortable materials that your cat will love to feel and scratch which is what makes them a more long-term solution. 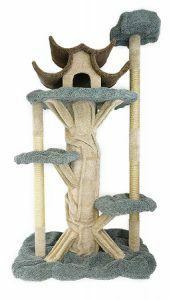 Freestanding cat trees are the type most of us are familiar with. They are the towers that you see at most pet stores in the cat section. 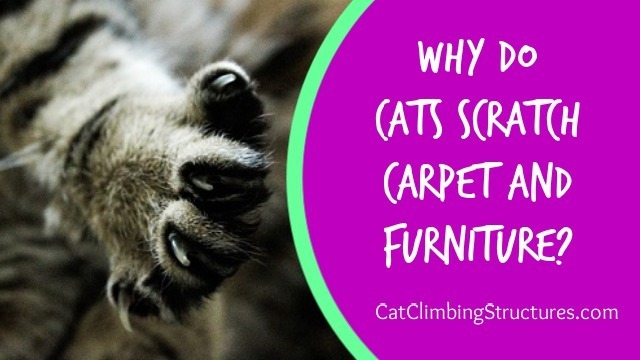 They also have scratching, laying, jumping and climbing areas for your cat. 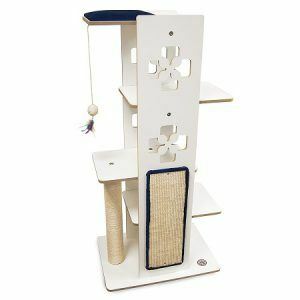 Even though free-standing cat trees are the most popular they fall short of caring for your ‘whole cat’. Remember the cat highway system we talked about earlier. Don’t take it for granted, this is a big part of cat culture. 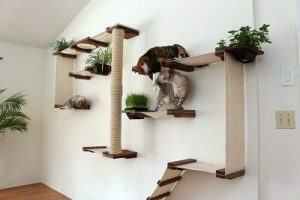 The best cat trees to use are actually wall mounted ones. Not only do they provide your cat with their needs but you also save a lot of space. 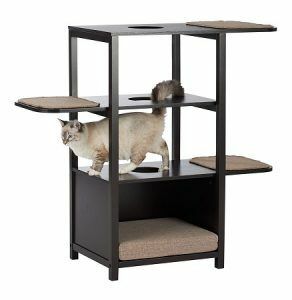 Apart from the main body of the cat tree, you will also put up other cat climbing shelves around the perimeter of the room, especially where the furniture is located that your cat loves to be on. 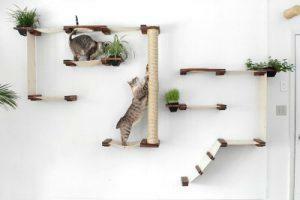 If you want to, you can always add some free-standing cat trees to connect the wall sections together. It will also help to add more variety for them as well. I hope this information was helpful. 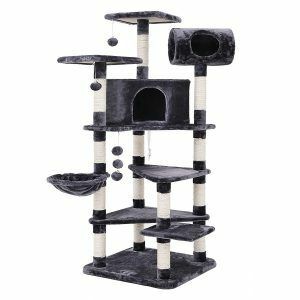 If you want to see my #1 recommendation for wall mounted cat trees, you can click the button at the bottom of the page. 3 Didn’t Find Your Cats’ Furever Trees? 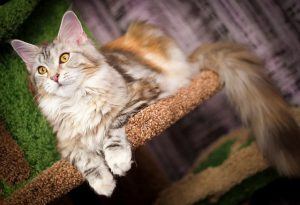 5 Why Do Your Cats Need Special Cat Trees? 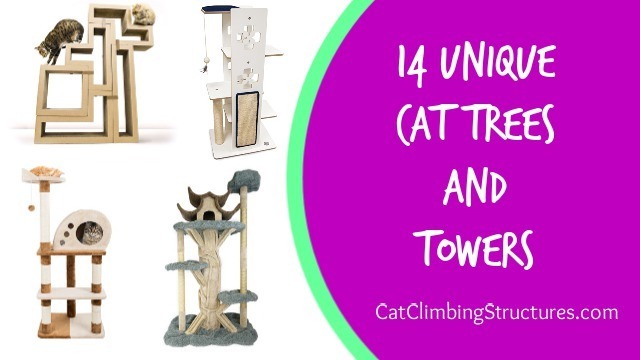 4 What Can You Do To Get Cat Climbing Structures for Your Cat? 1 Why Do Cats Sit In High Places? 2 Why Does Your Cat Sleep In High Places? 3 How To Get My Cat To Stop Jumping on The Counters and Tall Furniture? Domestic cats come in many different shapes and sizes. Likewise, your living situation can be just as varied. 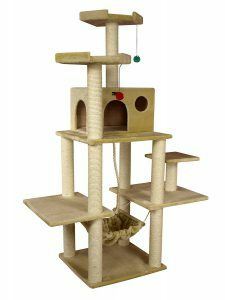 The purpose of this post is to provide you with a variety of the best cat trees in the UK that fit nearly every situation that I can think of! Click here to subscribe to CCS Newsletter. After careful consideration, these are the most well-rounded cat trees. This means that they perform ok in most areas such as for large cats, apartments, etc. but are not the best in any particular area. 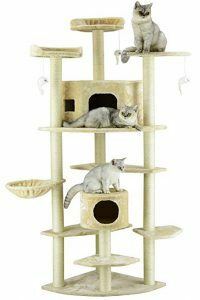 Be sure to read the entire article to be sure that you choose the right cat tree for your cat and unique situation. 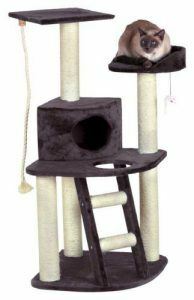 Armarkat is a top quality cat tree brand in general and that’s what you can expect when you get this tree for your cat. It is minimalistic but has everything your cat needs. This is perfect whether you live in a small space like an apartment or larger area. Its modern style will also blend in nicely with any living area decor. 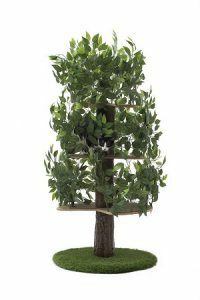 Your cat will enjoy this tree while you enjoy the peace of mind knowing they have a safe place to exert their energy instead of your living room couch. Type of Cats This Is For: Tree and bush dwelling, adult cats only. Did some research before I committed buying an Armarkat tower. Got to say I’m was impressed when I built it. Very strong robust heavy build quality. Compared to others I looked at. This tree is perfect for multi-cat families. It is sturdy and takes up very little space which makes it perfect for any sized space. It is also well rounded for different cat personalities. The condo has no openings for cats who prefer to stay hidden live cave-dwelling cats while there are beds at its highest points for cats that don’t mind being out in the open. It is also suitable for large cats although if you have multiple large cats, there are better options further down. 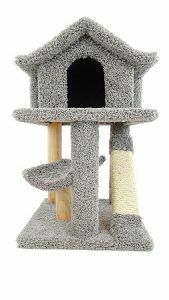 Whatever the case, your cats will enjoy many hours playing, scratching and sleeping on this cat tree. Type of Cats This Is For: All adult cats. Warranty: Manufacturer’s warranty not applicable. Check Amazon’s return policy. These trees are meant for homes with more than one cats. As the pet parent of multiple cats, you know they don’t like to share, lol. With this tree, they won’t have to. That’s because it has multiple of everything that matters like condos, beds, toys and scratching posts. I also like the condos because when you have multiple cats, chances are at least one will go into deep hiding. With these condos being so closed, they won’t have to dig deep into your closet to find their hiding place so you hopefully won’t have to search high and low trying to find them! This tree is sturdy and can handle multiple large cats on it at once. It also comes in a white variety of colors so you are sure to be able to match it with the color scheme of your personal space. Really good value, quick delivery. Very impressed with the quality considering the price. We were looking for something to keep our 3 very large cats happy! This certainly fits the bill. Like any good tree meant to be shared, this tree has plenty of condos, beds, toys, etc to keep everyone happy. Your cats will enjoy the comfortable plush covering as the relax and play on it. Again, I like these condos because they are closed which will give your cat the privacy it needs when it wants to get away from the other cat or/and others in the home. The only downside about this tree is that the beds are not extra large so if you have an above average sized cat, then they may have trouble fitting on it. There are plenty of other options for you though if this is the case. The dark grey color and light sisal will go well with nearly any color scheme in your home. 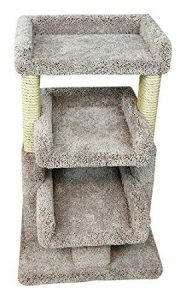 These cat trees are for your cat if s/he is over 15 lbs/6.8 kg/1.1 stones. This tree is H-U-G-E and sturdy. It is like two smaller cat trees put together. This design also gives it better stability much like table legs do for a table. This tree is quite unique. The plush covering comes in a couple of standard colours like beige but it also comes in pawprint variations as well. You will also find the rope covering the poles is different as well. Instead of the usual sisal rope, the posts on this tree are covered in coconut fiber rope which is not as strong as sisal. This is sort of a drawback about this tree since larger cats are likely stronger cats but it still does the trick and is easily replaceable should it be damaged. However, at the same time, if you have multiple large cats, this tree has several large condos for them to share so they won’t be fighting, feeling jealous or anything like that! 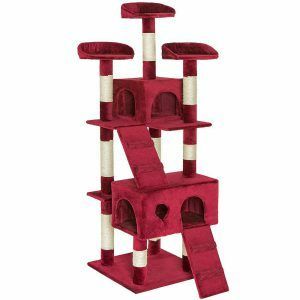 Good quality and amazingly big – I. R.
By far the Cat Tree Specialists are the kings of making cat trees for large cats. They are sturdy, comfy, and delivered at a decent price for the excellent quality you receive. This one is also designed for multiple large cats with extra large hammocks and beds. All the coverings are reinforced with glue so that no matter how rough your cats get, not even the sisal rope will unravel. This tree will make your cat feel comfortable and normal. Coming from someone who is in the ‘bigger than average’ club being an over 6 ft woman, it really means a lot when you find something that fits just right. Bonus points when you don’t have to pay an arm and a leg too! Every cats dream tree. Five out of five stars. 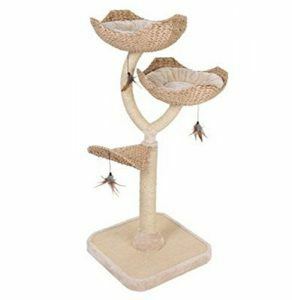 These cat trees are best for small living areas like apartments, double wides, small houses, etc. They will also work for smaller rooms like bedrooms if you want your cat to stay close by while you’re in bed, etc. Small spaces don’t mean that you have to cramp your cat’s style. 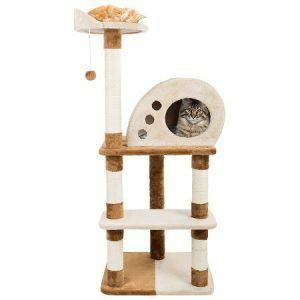 This small cat tree has everything your cat needs in a compact unit! It is also super sturdy which makes it suitable for large cats as well. Don’t underestimate the power of this small tree’s ability to increase your cat’s vertical territory either. Doing this is much safer than letting your cat out on the balcony especially if you live in a highrise apartment building. As soon as we put this item together my cat was on it. Now every day he sleeps in it and uses the scratch poles. 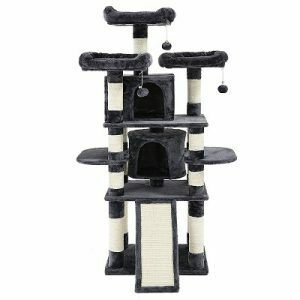 This chick little cat tree looks more like a piece of classy furniture than a cat tree. Doesn’t it?! 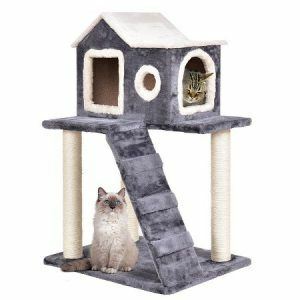 Not only will this one blend in with your living space so that it doesn’t take away from the little area that you do have, but it will also keep your cats happy! Although it might not look like it, this tree is also designed to handle large cats. Instead of being built with wood, its structure is formed with metal and the petals (beds) are woven with water hyacinth. And don’t be fooled. 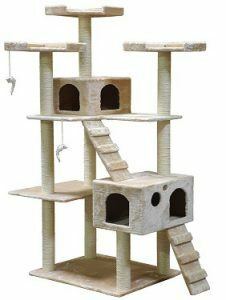 This tree is small but it gives your cat a lot of jumping and climbing area with three platforms! Best cat tree (Or cat bed) we’ve ever bought, So good we had to buy another tree to alleviate the the queue of cats waiting to use the baskets (We have 4 cats) It’s also built like a brick outhouse, A 14lb cat can run up it and it doesn’t even move. – MP. These cat trees are good for cats over 10 years old. They are also good for any cat with feline arthritis or any other joint or mobility issues. 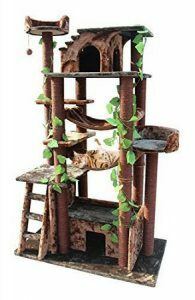 This tree is perfect for your senior cat because it has ramps that will take him/her all the way to the top which is important for him/her to safely climb up or down as needed. By giving your cat this gift, you will be enabling him/her to continue to lead a healthy life despite their inability to jump like they used to be able to when they were younger. The two large condos make it easy for them to share the space without being disturbed by rougher, younger cats which can be anything from annoying to hurtful. There are also multiple beds to share with other cats if you have multiple. This tree comes in many colors so it will be easy to match with your home environment and the covering material is super soft which may bring some much-needed relief to your cat’s aching joints. Type of Cats This Is For: All cats. This one is excellent if you only have one senior cat. It is also good if you live in a small space like an apartment with an older cat. 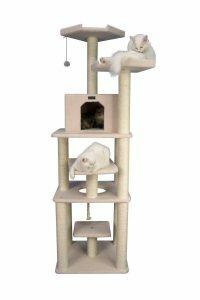 This tree has everything your cat will need to give it the slight exercise it needs with comfort and style. Very impressed. It’s sturdy and strong. 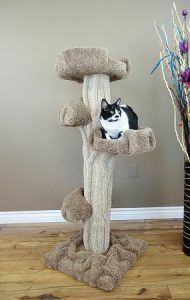 Bought to replace a similar cat tree which in comparison was not as good quality. Cats love it – Valeria G.
That is all for the 10 best cat trees in the UK. I hope that you have found this information helpful. If you have any questions please leave them in the comments box below and I’ll see you next time! 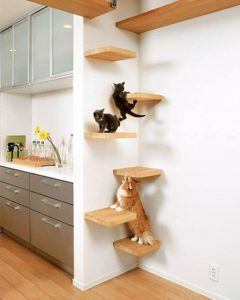 6 Why Do I Call This One The Best Wall Mounted Cat Tree? 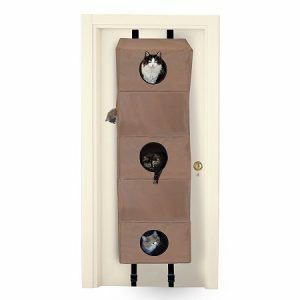 Wall mounted cat trees are the best cat furniture for cats because they are intricately designed structures that are off the ground and are situated around the edge of any room where cats prefer to be. The problem is that many of the models available are not very good and even if you want to build your own, you will find that there aren’t many good plans available either. 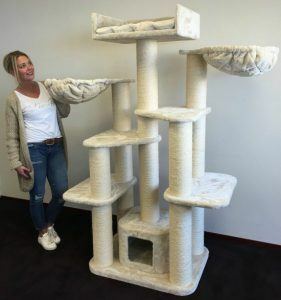 So we’ve looked through the available options and done the necessary research to present to you the best wall mounted cat tree for your cat. That is the Multi-level Cat Climbing Activity Center by Catastrophic Creations. It is a kit that provides you with all the materials you will need to build your own customizable unit. It is also very easy to clean and has many benefits for you cats that we will discuss in depth later on in this review. Levels: Designed for you to create your levels if you want. Who Is It For: Adult cats except for cave-dwelling cats. 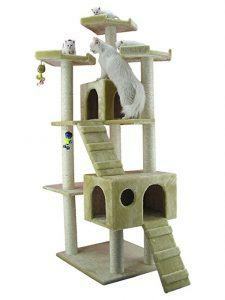 CatastrophicCreatsion Multi-Level Cat Climbing Activity Center is a fully wall-mounted cat tree system. 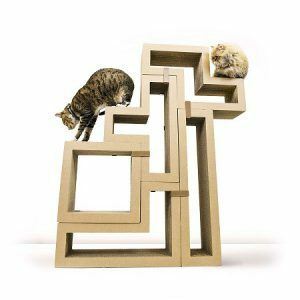 It is a kit that you will use to use intricate, tasteful walkways for your cat to climb, play, jump and scratch. 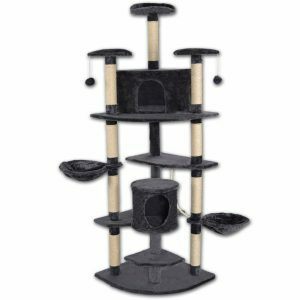 This kit comes with well-built scratching posts and platforms that are for holding food and water trays as well as plants. 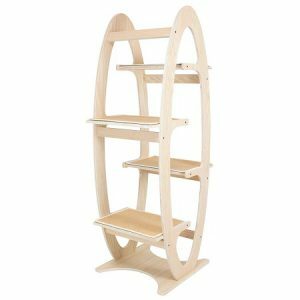 The biggest benefit to using this wall mounted cat tree opposed to using a traditional standing one lies within your cat’s own instincts and preferences. Cats like to see without being seen. They want to pay attention without getting attention. Cats don’t like to be surprised and they don’t like to be out in the open. The point is? 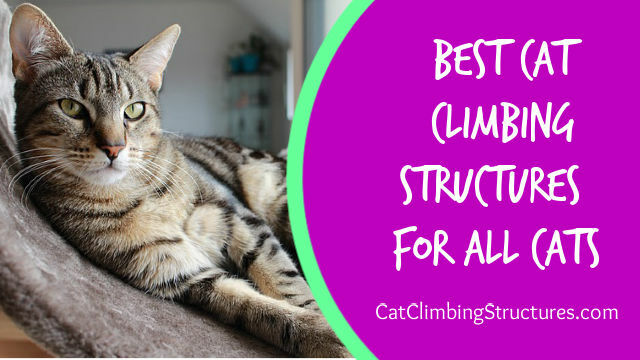 Your cat will feel most comfortable the closest it gets to the walls aka a wall mounted climbing structure. You might even be surprised that you actually see your cat more than usual since it has a safe place to chill. 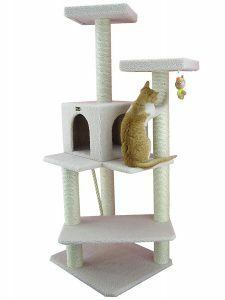 Another benefit of using this cat tree system is that your cat will get a better workout jumping, climbing and playing on a structure that is more tree-like with varying levels and shapes to them with the spring in each platform challenging their balance and so forth. You may have seen other wall mounted cat trees on the market but what I love about this one is that it is strong even though it is on the wall. 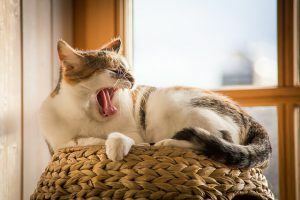 This means that you can rest assured that your cat and other members of your household are safe from it unexpectedly falling which is pretty hard to find whether buying a kit like this or building your own. This cat tree system is mounted to the wall with studs. You have to fully install it so some technical skills are required. But the instruction manual is super clear and easy to follow that even if you’re not the best DIY’er, you’ll be able to fix it. If not, you can always hire someone to install it for you which will save you time, stress and money because if you mess up something, it can be costly depending on what it is. Once the studs are up, the wood bards are secured to them. And the canvas platforms are held by the wood bars. This is for anyone looking for the best solution for their cat(s) health, well-being, and behavior/instincts. 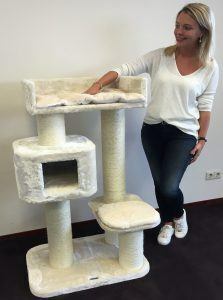 It is more interactive than traditional cat trees and with their easy to modify designs, you can continuously change up the design so that your cat doesn’t get bored of the same structure. 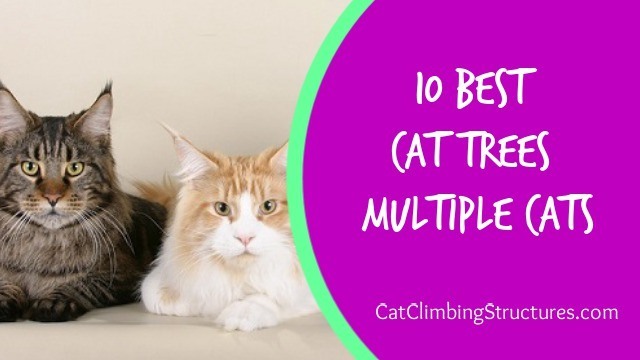 In addition, it is especially a great option for large cats because it is extra sturdy and has very high weight limits even for being a wall-mounted cat tree. That means that this unit can even hold multiple large cats at once without issue. It is also for people who may be experiencing behavioral issues with their cats. 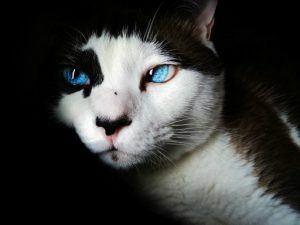 Because cats are so deeply rooted in predatorial instincts and resistant to training or conformity, sometimes if they don’t get the proper activity the unreleased energy can present itself as bad behavior. 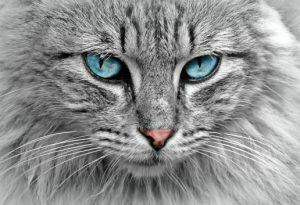 When it comes to your cat, it is important that you understand them as such. 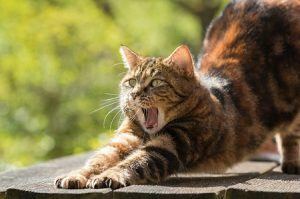 Their needs are those of cats and activity is a really big part of cat culture. So by giving them a structure that gives them their space to get their energy out while being engaged in what they love to do really makes a big difference in the same way it does when you get to do things that you love to do. Why Do I Call This One The Best Wall Mounted Cat Tree? 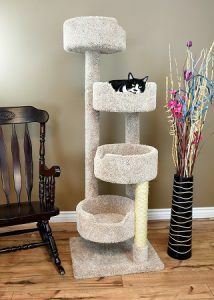 This might sound cliche to say but this cat tree is just plain awesome. Here are the facts. If you’ve done any amount of research in the cat tree space, in general, you’ll find that the majority of them are just not good. And it gets even worse as you learn more about what your cat really needs. This was one of the biggest reasons that I started this site in the first place was because I couldn’t find any good trees and I want to help you find and show you the GOOD ones in the sea of garbage. I mean, you can drop a couple hundred dollars on a tree that is a piece of junk and your cat hates it. Then guess what you have to do next? Cough up another couple hundred dollars on something else until you find something your cat STILL might not even like. I know, it’s frustrating. That being said, there are many videos and reviews of people showing their cats using and enjoying this unit. Even cats who seemed to ‘NOT like climbing the cat tree’. Why? Because as I mentioned, this takes care of your cat’s needs and looks amazing to it because it takes into account what its instincts drive it to do. I also love the design. Instead of screaming ‘cat tree on my wall‘, it whispers ‘decorative piece of wall art’. This thing is also super easy to clean AND the platforms are removable and washable! As you can tell, I love this unit. So without taking up too much of your time, I want to leave you with this last comment. The versatility of this structure is AWESOME! It is suitable for just about every cat type there is whether it be a large cat, senior cat or small cat. It is also suitable for multiple cats, small spaces like apartments and more! The value you get from this unit is worth more than this unit costs. Also, the Catastrophic Creations brand itself has so many other models that if you have to choose a smaller one, for now, you can do that and still be able to experience top-notch quality. I can honestly say that there’s not a whole lot to dislike about this unit. The price point is high but the good news is that you can buy smaller versions for much less. You’ll just be spending more in the long run but what works for your budget works. At the end of the day, the money isn’t the important thing. Math: Average cat lives 16 years. Cheap trees don’t last more than 2 years and cost roughly $150. So divide 16 by 2 you get 8. So you see, if you get a cheap tree you see that you’ve already racked up a thousand dollar bill and that’s without the furniture your cat keeps destroying. 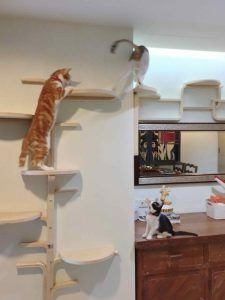 Is This Really The Best Wall Mounted Cat Tree? 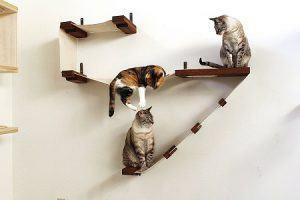 Our final verdict is that this really is the best wall mounted cat tree on the market. Its handcrafted, sturdy and built with top quality material. The design is versatile so even if you don’t like the instruction’s setup, you can customize it to something else you like. Catastrophic Creations make it super easy to install this unit too. Cleaning it is easy as well which is something you can struggle with most other cat tree setups. 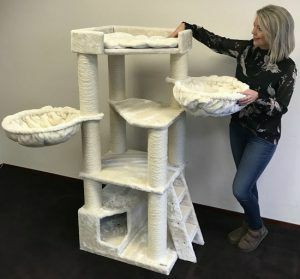 And best of all, its perfect for just about every cat setup you have whether you have multiple senior cats, large cats, or a mix of different types, this cat tree is built to take on the challenge. 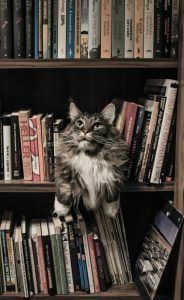 I hope that this review has helped open you to a new world of possibilities to accommodate your cat whether you have a big home or a small apartment. 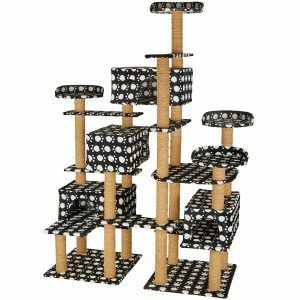 Buy The Catastrophic Creations Multi-Level Cat Climbing Activity Center Now!